BALI, Indonesia- The 21th Asia-Pacific Economic Cooperation (APEC) leaders’ meeting concluded here Tuesday following extensive discussion on issues most related to the region’s growth. After two rounds of retreat sessions centering on strengthening the multilateral trading system and improving connectivity in the evolving regional and international architecture, APEC leaders reached consensus on issues such as attaining the Bogor Goals in 2020, promoting a thriving multilateral trading system and building better connectivity in the Asia-Pacific region. “We share the view that all APEC economies must continue to gain from the APEC cooperation,” said Indonesian President Susilo Bambang Yudhoyono in his closing remarks. The leaders agreed that the strengthening of multilateral systems will bring great benefit to APEC economies. “The success of the multilateral regime remains very critical,” said the president. 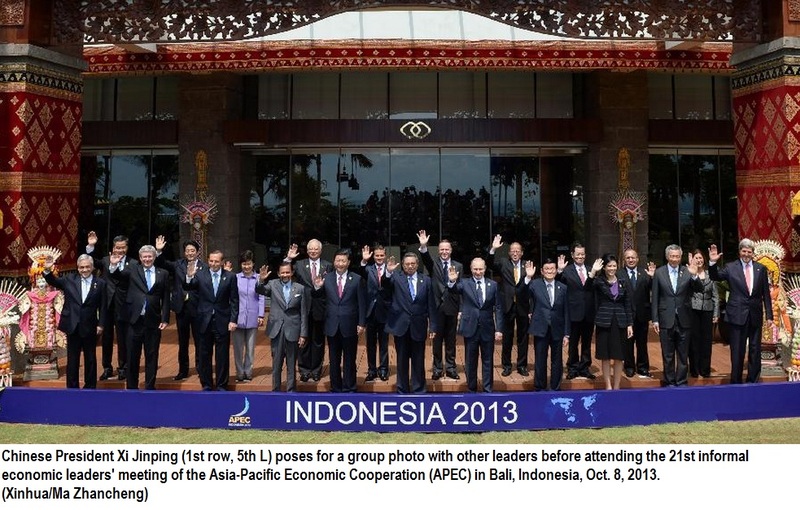 APEC leaders also issued a joint declaration at the end of their meeting. As the highest-level meeting of the APEC, the informal economic leaders’ meeting has been held annually since its first convention in Seattle, the United States, in November 1993. Next year’s APEC summit will be held in Beijing, China. The APEC has 21 member economies which account for 54 percent of the global gross domestic product and are expected to grow 6.3 percent in 2013 and 6.6 percent in 2014, according to the International Monetary Fund. President Obama couldn’t attend this because of a few dumbasses in the House Of Idiots.